Increase in static electricity: Not only can this be a painful to you when you receive a shock, but high levels of static electricity in your home can cause damage to your home electronics. Damage to furniture and floors: A lack of regulated humidity can take its toll on wooden floors and furniture. Moisture in wood keeps it flexible, while a lack of moisture can causes cracks. Dry air contributes to Illnesses: When your air in your home is dry, you are more likely to get sick. Germs travel better in dry air, and the lack of moisture makes your natural immune defenses more vulnerable. Not only that, but dry air causes dry skin as well, which is very uncomfortable and miserable on its own. Chicago Heating and Cooling Companies are such as Polar Heating and Air Conditioning can install a Powered Humidifier at an affordable price. Also, you can have it installed in a day. Why continue to suffer the shocks, dry skin, home damage and more? 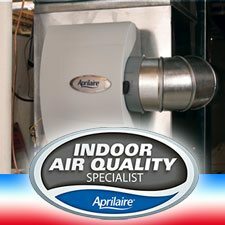 Contact the indoor air quality experts at Polar today for a free estimate today! We can have your humidifier installed on the same day and you and your family can breathe easier.